This is a instrument provided for controlling a electronic expansion valve, in addition to overheating, pressure, defrost and ambient temperature control. This is a instrument provided for controlling a electronic expansion valve, in addition to overheating, pressure, defrost and ambient temperature control. 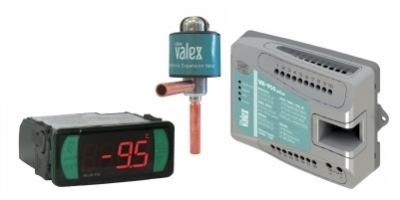 This means that the VX-950 plus controls the liquid flow and also the refrigeration process like defrost, replacing the controller or thermostat of a installation. This product is compatible with the common capability’s valves to refrigeration systems, meeting installations with evaporators until 35kW of power. Because of its precision and technology, this product generates an immediate saving of around 20% in the acquisition of equipment for the cooling system, once they can be compact and have less capability. In the medium term, you can also see a saving in the system’s energy efficiency, in addition to other advantages such as endurance and less maintenance of the compressors. With the whole system, it is possible to monitor the controls in three ways: monitoring only with Sitrad, only with the Human-Machine Interface (HMI) or with both at different RS-485 networks. Using only a HMI you can monitor up to 32 controllers VX-950 plus for viewing measures, parameter setting functions and commands such as manual defrost and function block.